To view the 2012 show schedule, click here. If you chose the dinner add-on ticket option, the Dinner is located at the Dutch Valley Restaurant next door to the theater at the Carlisle Inn in Sugarcreek. Dinner meal tickets are valid for 1 meal on the day of the musical between the hours of 11am and 8pm (excluding Breakfast). It is recommended to arrive for dinner at least 2 hours before The Confession Musical (for the evening performances). Your choice of broasted or baked chicken, grilled ham or turkey, along with dinner rolls and your choice of 2 sides or 1 side and the salad bar. Pie and beverage are also included. Tax and gratuity are included. Your choice of two meats (chicken, ham, roast beef and turkey), along with dinner rolls, salad bar, mashed potatoes, vegetable and dressing. Pie and beverage are also included. Tax and gratuity are included. A variety of meats, side dishes, pasta and other specialties, along with dinner rolls and salad bar. Pie and beverage are also included. Tax and gratuity are included. Children with a $0 ticket value will have to sit on a lap of an adult (they do not receive their own seat), and do need to have a ticket for entrance. To purchase an Overnight Hotel Room Package (which will include a theatre ticket), please call 855-411-2275. Discounts are available for groups of 20 persons or more. Please call Richele Pittman at 855-411-2275. Theatre Ticket & Plated Meal Package The Dinner is located at the Dutch Valley Restaurant next door to the theater at the Carlisle Inn. Dinner meal tickets are valid for 1 meal on the day of the musical between the hours of 11am and 8pm (excluding Breakfast). 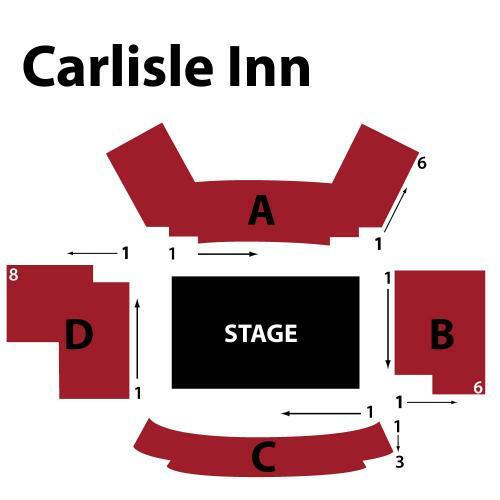 Theatre Ticket & Family Style or Buffet Meal Package The Dinner is located at the Dutch Valley Restaurant next door to the theater at the Carlisle Inn. Dinner meal tickets are valid for 1 meal on the day of the musical between the hours of 11am and 8pm (excluding Breakfast).